This weekend saw the opening set of fixtures for the Junioren Bundesliga U19. Bayern Munich were shocked by an upcoming academy, Wolfsburg started the defence of their title with three points and Schalke thrashed the league’s newcomers. Read about it all in our weekly feature. Frankfurt celebrate their win against Bayern Munich. After a goalless first half, Marc Kempf opened the scoring on 49 minutes before Ozgur Ozdemir doubled the score with a penalty on 81 minutes. Luca Waldschmidt secured the win in the final minutes of the game. “That was a great season opener. The game was initially balanced, then we got the upper hand and won deservedly. The guys played really good and beautiful football,” said Frankfurt coach Holger Mueller. Elsewhere Stuttgart beat Astoria Walldorf and Kaiserlautern and Freiburg played out an entertaining 3-3 draw. Eintracht Frankfurt 3-0 Bayern Munich; VFB Stuttgart 2-1 Astoria Walldorf; Mainz 05 2-1 Hoffenheim; Wacker Burghausen 2-5 Karlsruher SC; Unterhaching 1-1 Greuther Furth; 1860 Munich 3-3 Augsburg; Kaiserlautern 3-3 Freiburg. VFL Wolfsburg got their defence of their German U19 title underway by beating Union Berlin 5-2 away from home but suffered a shaky start after the hosts raced into a two goal lead. Wolfsburg coach Dirk Kunert said: “We controlled the game from the beginning, but at first acted not determined enough. Berlin occurs twice our goal and it is two nil. Yet how our guys responded then, was strong. Within ten minutes we turned the game . The second half was OK. But since I was not so happy with our performance. We should have played more clearly. ” Wolfsburg were saved by goals from Tolga Cigerci, Julian Brandt, Federico Palacios (2) and Niklas Tille. Lubeck 5-2 Dynamo Dresden; Union Berlin 2-5 Wolfsburg; Carl Zeiss Jena 1-2 Werder Bremen; Hertha Berlin 4-1 Osnabruck; St Pauli 1-1 Hansa Rostock; Rot Weib Erfurt 3-1 Hannover 96; Hamburger 1-2 Holstein Kiel. Action from Schalke v Theesen. Elsewhere in the division, Leverkusen just edged Bochum by four goals to three and Borussia Dortmund were stunned by Wuppertaler SV, who beat them 3-2. Bayer Leverkusen 4-3 Bochum; Rot-Weiss Essen 1-1 Fortuna Dusseldorf; Wuppertaler SV 3-2 Borussia Dortmund; Bonner SC 1-1 Koln; Borussia Moenchengladback 3-1 Rot-Weib Oberhausen; Theesen 0-5 Schalke; MSV Duisburg 1-0 Arminia Bielefied. 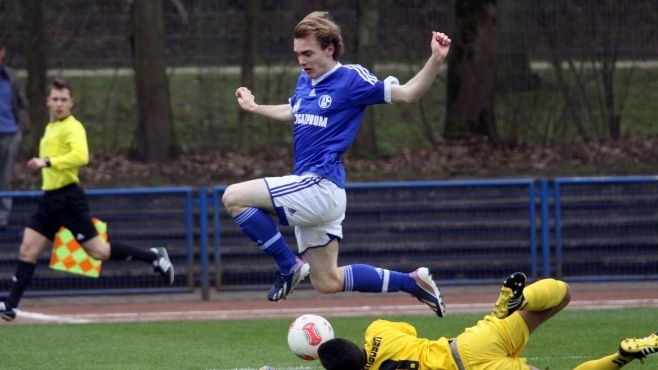 Check out our dedicated Bundesliga U19 page here.